Attention Deficit Hyperactivity Disorder, to use its full title, refers to a condition in which a child (or adult) displays excessive inattentiveness, hyperactivity and impulsivity. These symptoms can occur in varying combinations, giving us three subtypes of the condition, namely the inattentive, the combined, and the hyperactive-impulsive subtypes. We refer to the condition as ADHD, whether or not there is hyperactivity present. The term ‘ADD’ doesn’t actually exist officially, although colloquially, it is often used to refer to children with the inattentive subtype of the condition . Studies suggest a worldwide prevalence of around six percent of school-going children. It seems to affect boys more than girls. ADHD not the sole preserve of childhood. It persists into adulthood (so-called Adult ADD) in around 60% of cases, and many adults still require treatment for the impairing symptoms of the disorder. The typical symptoms of ADHD include distractibility, short concentration span, forgetfulness, absentmindedness, procrastination, careless mistakes, failure to complete tasks on time and poor impulse control. As you will have noticed, these symptoms can affect anyone from time to time, so in order to diagnose the condition, the symptoms have to be excessive for the developmental stage of the child, and they have to cause significant impairment in his or her daily functioning, especially at school. ADHD is a brain condition. It is not an attitude problem or the result of poor parenting. Numerous studies have demonstrated altered brain physiology in those with ADHD. It is highly genetic, in fact one of the most highly heritable conditions in medicine, although other risk factors are known to play a role in the disorder. The treatment of ADHD typically involves a multipronged approach. Stimulants (such as Ritalin and Concerta) are the most widely used medications for ADHD, although there is also data supporting the use of the non-stimulant Strattera. All of the ADHD medications can cause side-effects, and therefore careful monitoring is required in all children prescribed these agents. Behavioural strategies such as positive reinforcement – implemented both at home and in the classroom – should also form part of the management of any child with ADHD. A balanced, healthy diet is important for several reasons, but research does not support dietary treatment of the condition, except in specific situations where there are documented food intolerances. Some studies have shown improvements in ADHD symptoms with omega-3-fatty acid supplementation. 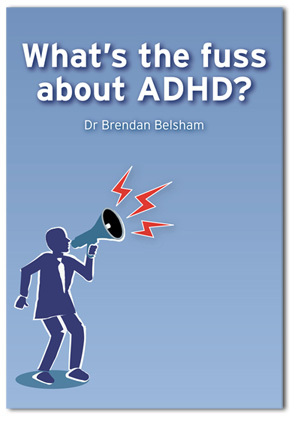 For more information our Articles of interest section has quite an extensive collection of articles written by Dr Belsham or purchase his book, “what’s the fuss about ADHD?”. It’s written with the parent in mind and is an easy and insightful read.